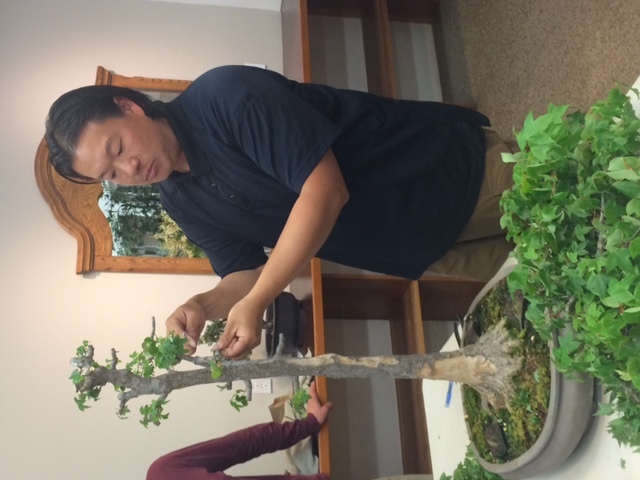 Our ongoing program with Peter Tea continued in May with Peter’s May 3rd presentation on the topic of deciduous trees. 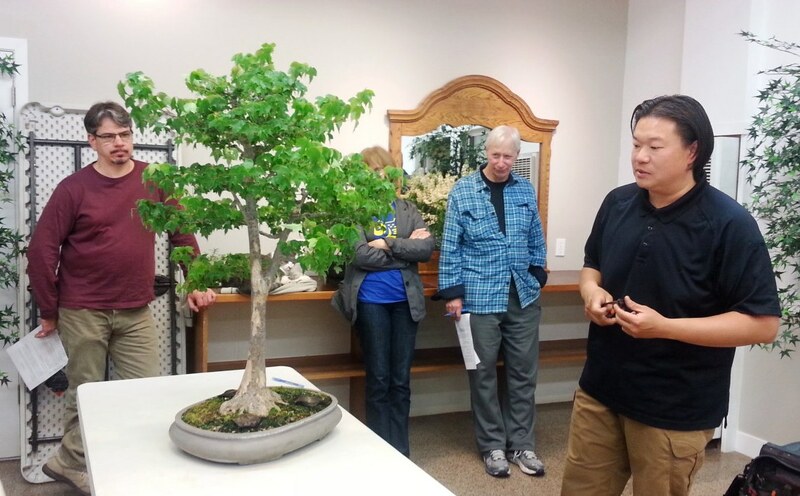 Peter emphasized techniques appropriate to our season, delving into considerable detail and wrapping up by demonstrating a heavy prune on a trident maple he brought. After an unusually cold May, it occurs to me that another one of the many reasons Peter Tea is such a good teacher for us is because of his flexible approach to the timing of bonsai techniques. He avoids overly specific time periods for when to prune, repot, etc. This makes particularly good sense in the San Francisco Bay Area, where a diverse array of microclimates can dramatically skew the timing for such things from one locale to another. 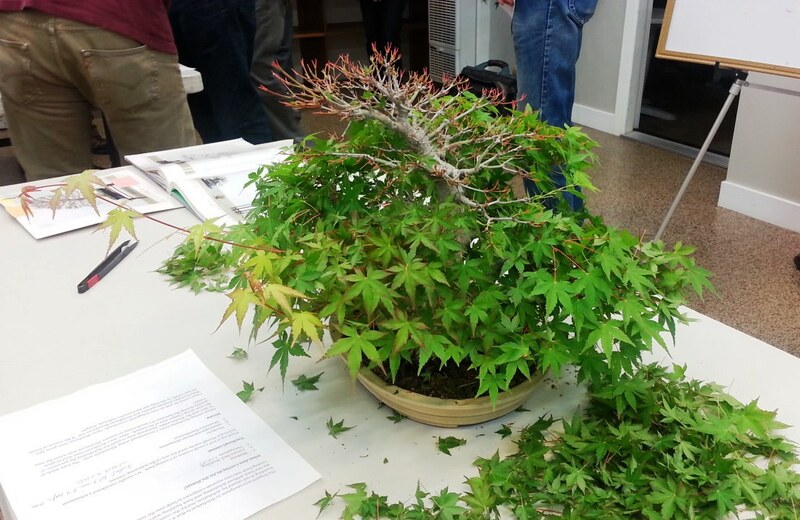 For instance, one of the primary topics of his May 3rd presentation was the cutting and pinching of deciduous trees. Rather than generalizing to a season or specifying a month when pruning is most appropriate, Peter urged us to learn to look for certain signs that a tree is ready for pruning. What are the signs that a tree is ready for heavy work, such as pruning? Peter named three things that we should look for: (1) Bushiness, or at least healthy leaf growth all over the tree. (2) The tree should have runners—one or more rapidly growing branch tips or tops, which indicate that the tree is vigorous. (3) The foliage should have hardened off, reflected in changes in the texture and color of the leaves (discussed at greater length in an earlier presentation, but generally going from delicate and soft to stiff and coarse). 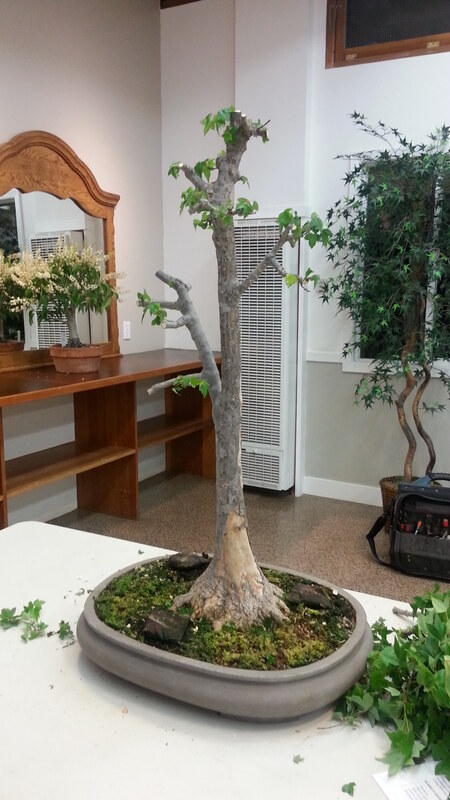 If the tree is exhibiting these behaviors, then it is healthy enough to withstand the stress of your styling. As if on cue from my comments in the May VP of Programs posting, Peter also talked at great length about defoliation. Perhaps he reads our posts, because he made a point to differentiate and clarify the effects of defoliation versus cutting. To be clear, when we say cutting we’re talking about trimming at least the tip, often more, of a branch or treetop. Defoliation is the removal of leaves from some or all of a tree that is suited for that technique. Peter was insistent that defoliation does not influence back-budding. If you remove the leaves, more sun will get to the interior of the tree, which MAY in turn influence some interior (back) budding, but considering how quickly the leaves grow back, this is rather unlikely. According to Peter Tea, cutting is the best way to induce back-budding. Don’t forget: the repositioning of branches, such as through wiring, lets light into the interior, making that another good way to induce growth there. Peter was also unwilling to say that defoliation causes ramification, but he explained its role in the maintenance of ramification that has already been developed. He gave the example of a branch that has successfully pushed out some interior growth—some back-budding resulting from trimming or other styling that redirected energy. But before long, the extremity of the branch is going to start hogging the energy again and that interior growth is prone to die off. If the end of the branch is defoliated, however, the interior growth will once again receive a greater share of the tree’s redirected energy and is more likely to survive to fill out the interior of the tree. Trident maple reporting for a trim. 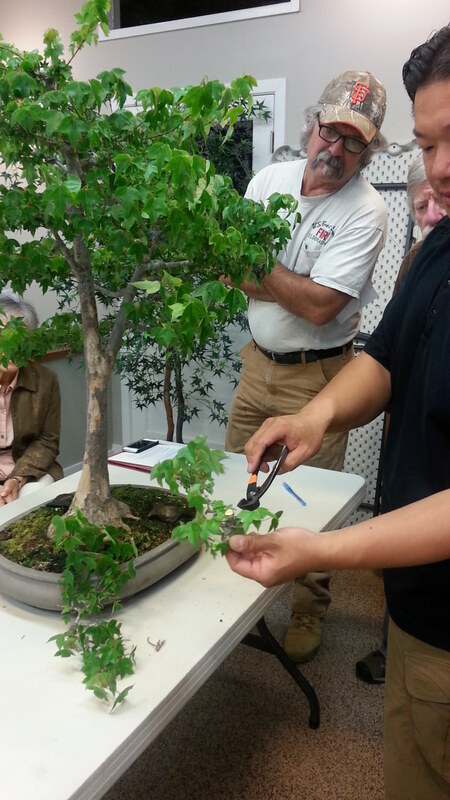 After the lecture portion of his presentation, Peter set about pruning a trident maple in order to demonstrate some of what he had been discussing. It was a trident from our last auction as a matter of fact. It needed a lot of work and Peter didn’t hold back. Throughout the rather heavy pruning, he showed us how the triangle shape we’ve all been taught to emulate in our tree profiles is not just an aesthetic, it’s the way the tree wants to grow in order to maximize sun exposure at every point along its height. Evergreens and conifers are a little more flexible when it comes to sustainable structure, but with deciduous trees, Peter stressed that any branch shaded by another branch stands a high likelihood of being abandoned by the tree’s energy distribution efforts. So whenever he had a branch he wanted to keep that was shorter than the branch above it, he whacked away at that upper branch until it was shorter than the one below. Sometimes, if that couldn’t be done, entire branches had to be removed. It was quite a spectacle to see how much of the tree Peter removed to get it to a point where he could be confident that all subsequent growth would contribute to, and benefit from, the tree’s development into a better bonsai. The tree Peter was pruning was only for demonstration purposes, there was no raffle at the end of the night. Come see Jay McDonald’s demonstration on June 7th, however, and you will have the opportunity to try to win the bougainvillea he will be carving. Apparently he has had this bougainvillea for awhile and has always wanted to carve on it, but is willing to give it up after that. So come learn about carving the deadwood on bonsai and you could go home with a Jay McDonald original!